I have long wanted to visit the Cinque Terre, it is a place that has captured my imagination, so the other week I seized my chance and visited this tiny wine region. The place is named for the five towns – Cinque Terre – which sit in a spectacular landscape of intricately terraced agricultural land covering steep cliff faces all the way down to the sea. The towns themselves cascade down the cliffs in the most amazing way that makes them achingly picturesque – especially in the sunshine. These towns sit at the head of small valleys, ravines really, which means they can be at sea level rather than on the cliff tops – historically these lands were quite isolated and, before the railways, the main form of communication between them would have been by water. Even today the best way to see the vineyards is by boat as they are dispersed away from the towns and getting around is still hard. 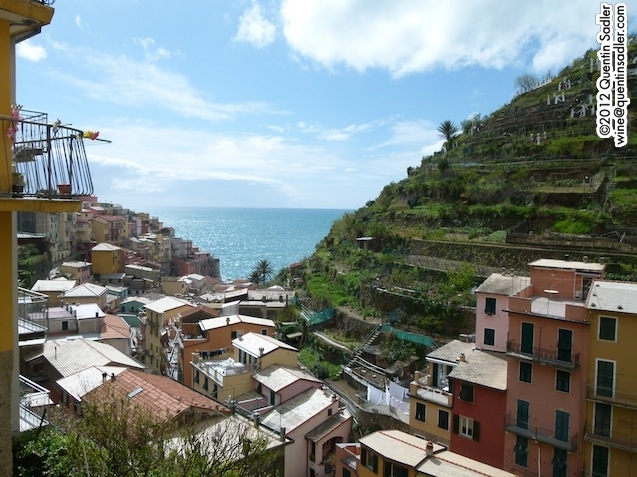 Corniglia is the one exception, it sits on the cliff-top and has no harbour. Luckily nowadays this once cut off land is more accessible to the traveller, but – throngs of tourists apart – it retains its wild, challenging feel. There really is a sense of other here, of a land set apart. The short train ride from La Spezia alone is a joy, taking you to a very different place, by turns passing beautiful countryside, past steep vineyards, through deep tunnels and hugging the sea’s edge. It deposits you at the town of your choice and from there you can then either walk along the beautiful coastal path that links all five – one section is rather wonderfully called the Via Dell’Amore – take more trains or try for the ferry. Sadly when I was there the sea was far too rough for the ferries to operate. 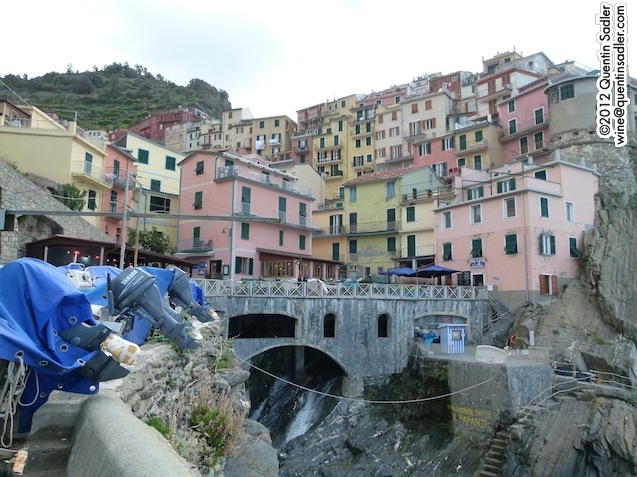 I arrived in Manarola where I spent a little time soaking up the atmosphere and taking in the views. Walking around was easier than I had anticipated in one way as I seemed never to get lost, but everything is very steep – bad news for me as my knee chose that day to play up for the first time in years. Then the serious work began, where to have lunch and how to find Cesare Scorza who runs a local winey and with who I had a tentative arrangement to meet. No sooner had I started thinking about this when, glancing up, I noticed that I was standing right outside Cesare’s shop – so you see I couldn’t get lost. The shop shares the name of Cesare’s wine brand, Burasca and it was crammed with foodie delights, a wide range of local wines, honeys, sweets, salamis, oils and sauces – Liguria is the home of pesto. Lemons grow in abundance around here, so there were lots of lemon flavoured things, especially Cesare’s own production Limoncino, the Ligurian lemon liquour. I introduced myself to the lady behind the counter and she told me that I should come back later as Cesare was working in his vineyards around Vernazza – another of the five towns. She also recommended a place for lunch, so I set off downhill to the waterside restaurant and nabbed the last table that faced the sea. I was astonished when the waitress came and told me that someone was on the phone for me. Who knew I was there and how did the lady know who I was? The answers were simple, it was Cesare whose assistant had called him, told him where I was and he had telephoned the restaurant. We arranged to meet after I had finished my lunch, which was rather terrific. I deliberately stuck to regional specialities and while it was all good, the fresh local anchovies were exquisite, sweet, succulent, tasty and perfect with the local wine. 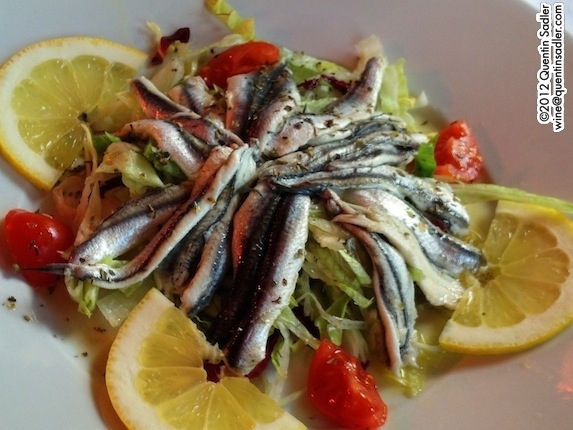 Acciughe di Monterosso, the local anchovies, are so famous and sought after that they have their own P.D.O. It was here I had my first taste of the local wine with a half bottle of the 2011 Cinque Terre D.O.C. from the Antichi Sapori Liguri company and I must say it was pretty good. The nose was quite idiosyncratic in a way that I soon came to recognise, it was mineral and offered earth and truffle with hints of honey and pithy lemon. Even a dash of salty air came out of the glass – it really wasn’t from the air around me, I checked. The palate was surprisingly rich, I had expected something light and crisp, but this had a touch of creaminess to the texture giving it a succulence rather than a crispness. There were pithy grapefruit flavours and the high acidity was balanced out by the weight. I enjoyed it, it was a nice, straightforward and enjoyable wine, but with a little dash of something different – 85/100 points. Feeling that I had experienced a good slice of the local gastronomic culture I set off to Cesare’s shop, where I was given directions to his winery – which really only need to have been one word; ‘up’. I climbed and climbed up winding lanes, narrow crumbling stairs and finally, out of breath, I was there. 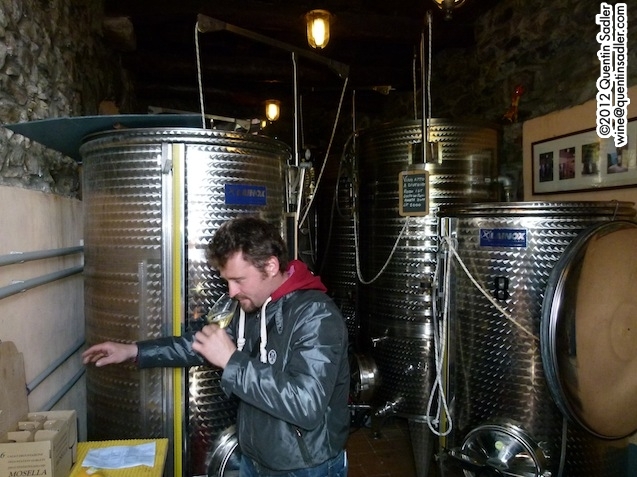 It was an amazing place – I have seen some tiny wineries in my time, but this was miniscule. Cesare controls 2 hectares of vines, so production is not huge, but he told me that by local standards his estate is massive. Small though the winery is, it is beautifully equipped with rows of small computer controlled stainless steel fermentation tanks. The focus here is on the dry Cinque Terre white and after having tasted a commercial example I was keen to try one from a boutique winery – and you cannot get much more boutique than this. The nose gave off lemon rind with a dash of honey and savoury herb notes of rosemary. The palate was concentrated with quite a rich mouth feel that coats the mouth like runny honey, there were ripe apricot flavours too, all balanced by high acidity that produced a delicious wine with a long, long finish that left you with a salty mineral and savoury aftertaste that I found very attractive indeed – 90/100 points. 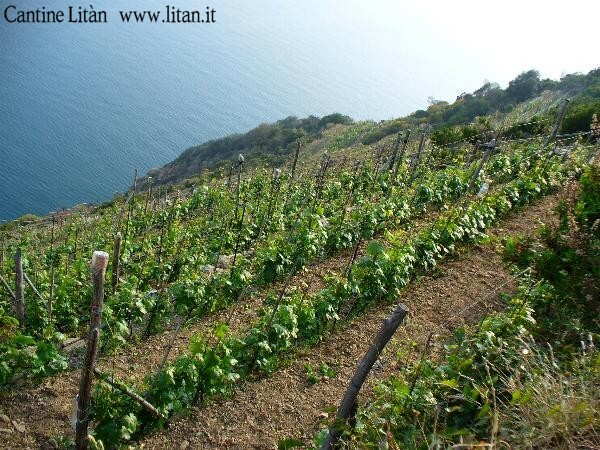 Cesare is also very proud of his Sciacchetrá (Shack-et-Tra), the traditional sweet wine of the Cinque Terre. 70% Bosco, 20% Vermentino & 10% Albarola grapes that were dried for 45-60 days. The nose was of delicate dried apricots and rich butter. The palate was wonderfully fresh and lively with a deep apricot flavour and with apricot’s high acidity, caramelised oranges and salty caramel. I liked this for its seductive depth of flavour, balancing high acidity and richly mouth coating texture. This was my first ever Sciacchetrá, but I know that they vary enormously in style from vaguely sweet to luscious dessert wines nearing a Vin Santo in style – this was of the latter type. Perhaps not as complex as a Vin Santo, but it was wonderfully well balanced and hugely enjoyable – 91/100 points. I was so glad to meet up with Cesare, it was a fascinating eye opener to the scale of winemaking here and to the styles produced. I was very impressed by what he did and the balance of dedication and nonchalance with which he did it. 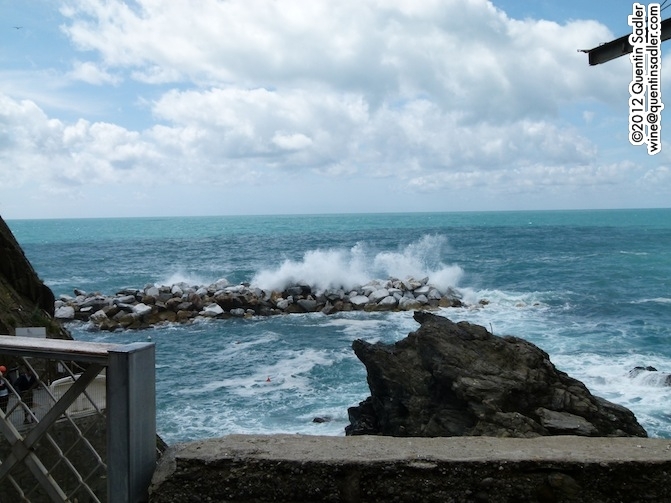 Thrilled by what I had tasted I bid him adieu and set off for the nearby town of Riomaggiore. Here I had a sort of appointment with Orlando Cevasco of Cantine Litàn, we had exchanged emails and he said he would meet me in the Bar Centrale. I had no idea where that was, so had carefully printed off a map to help, but was struggling to see any street names. I needn’t have worried, looking up the first thing I saw was the…Bar Centrale! What happened next was quite unexpected. We walked uphill for a few yards until we came to an ancient looking door. Orlando opened it and waived me through and up the flight of stairs, round a landing and more stairs, through another door and we were on another street parallel but much higher up from where we started. We walked along a bit and then down an alley, around a corner and up a flight of steps, then across another alley and we had arrived at the Cantine Litàn, not quite the smallest winery I had seen that day, but not far off. We were also high up above much of the town. While I expressed amazement and got my breath back Orlando grinned and told me that all the grapes for his wines were hand picked and then came up to the winery the same way – it must be back breaking work heaving tubs of grapes up these steps and slopes. On entering the winery I was again struck by how tiny it was, just an arched alcove built into the face of the cliff – which is visible through the window on the back wall – and also how well equipped it was. 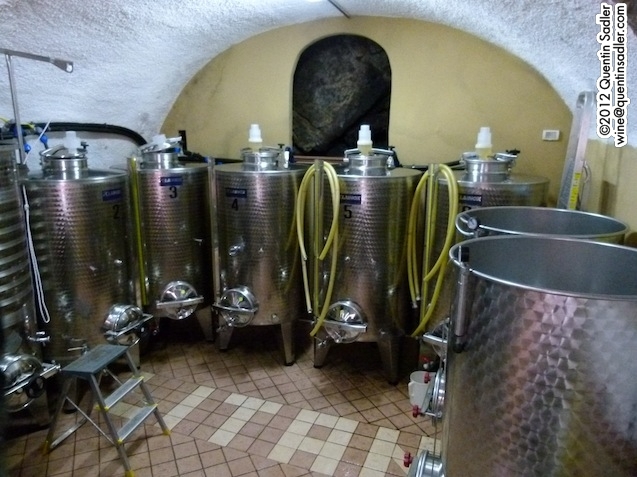 The tanks were small, but they were serious pieces of equipment and boded well for the wines. 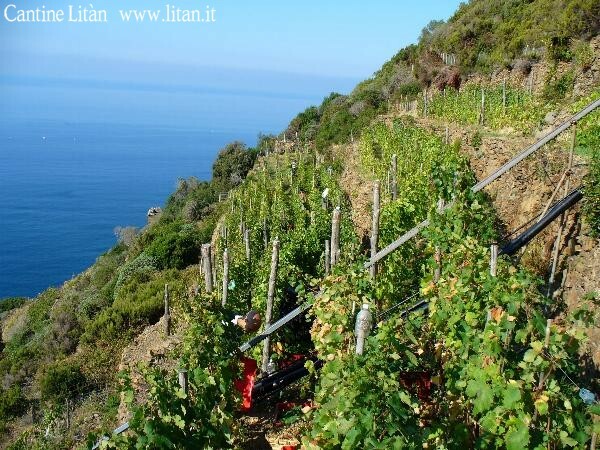 Cantine Litàn is the brainchild of three passionate young men, two brothers and a cousin, Francesco Cevasco, Orlando Cevasco and Luigi Andreotti who have spent a decade renovating the winery and the 1 hectare of old family vineyards on the steep inaccessible slopes. 60 % Bosco, 30% Vermentino, 10% Albarola – cold fermented with the natural yeast and aged on the lies for 7 months. This was the palest of my Cinque Terre wines, very lemony straw and fresh to look at. The nose was mineral, sappy, nutty and apricot-like with a salty, earth and rocky mineral note together with some savoury herbal aromas too. The palate was fresh with bright, but not searingly high acidity, luscious citrus peel and honey together with a walnut bitterness, herbs and those beguiling saline and mineral, earthy notes that made it really interesting. There was a lovely long savoury salty finish like a pretzel and the fruit lingered too like peach skin in your mouth. Another lovely wine that offered some real elegance – 90/100 points. 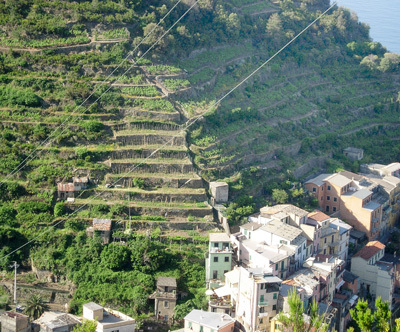 In case you were wondering, Costa de Sera is the local Cru to Riomaggiore – there are two other Crus in the Cinque Terre; Costa de Campu around Manarola and Costa da Pose around Corniglia. 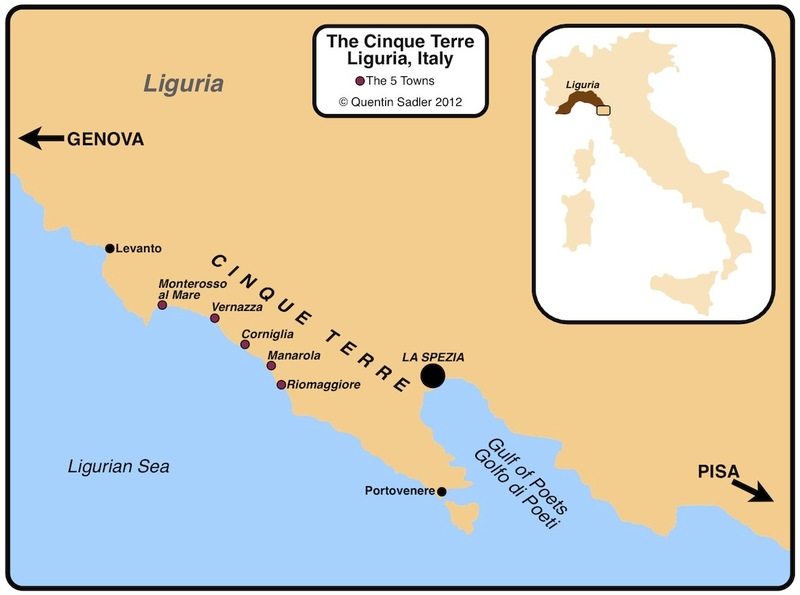 In order to achieve Cru statusthe grapes have to come from the designated sites and to have slightly lower yields and higher minimum alcohol levels from straight Cinque Terre. Roughly a quarter of the crop is set aside for the beloved Sciacchetrá which makes just 800 half bottles. 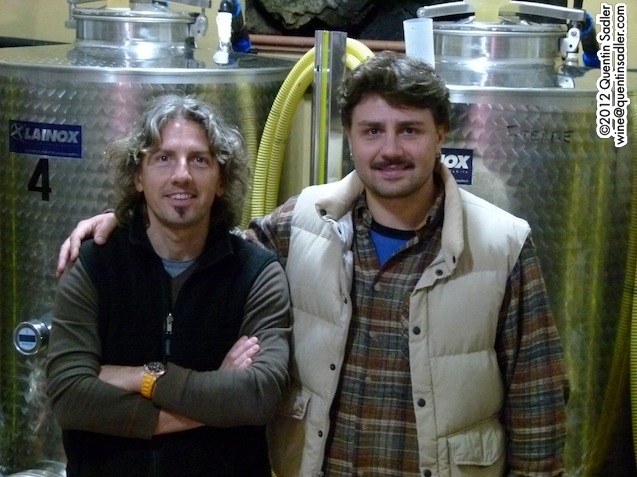 This is young, so is a Vino atto Diventare, working through the process to achieve D.O.C. 60 % Bosco, 30% Vermentino, 10% Albarola grapes dried for 2 months on wooden racks and 10% is aged in chestnut barrels. The colour was a lovely light golden syrup amber. The nose gave off delicate walnut and coffee with sultanas and dried apricot notes. The palate offers lovely rich sweetness balanced by a real freshness that is emphasised by its youth that makes it almost spritzy. Some tannin mouthfeel all the way to the finish gives it richness and weight as do the maple syrup, coffee, nuts and caramel flavours and there is still that little salty touch lurking in there somewhere. I know this is not a finished wine, but it is quite delicious, light, but elegant and well balanced dessert wine that has good acid balance. I would love to try the finished wine sometime – 90/100 points. So, I had tasted all they had and had been delighted with what I had experienced, thank you Orlando and Francesco for being so welcoming and kind. My visit to the Cinque Terre did not disappointed me. The towns are lovely to look at, the sea is vibrant and wild at times, the landscape is dramatic and the wines are fascinating. They deserve to be admired – not only for how they taste, but also for how the producers triumph over the difficulties of growing grapes in this extraordinary place. That the wines themselves seem to be excellent modern dry whites that would partner so many of the foods we eat today is a bonus. It is remarkable that so many white grapes from around the Mediterranean world have had to wait for modern technology to come along to change the age old perception that these countries cannot make white wines. This is chiefly because they oxidise very easily and so in the not too distant past before cold fermentation and clean wineries the Bosco grape would have produced much less interesting wine than it does today. Looking back at old wine books from 20 odd years ago no one seemed very impressed by the Cinque Terre, so I can see that this is yet another region that has improved enormously with the application of modern technology as well as the passion and hard work of the new generation of winemakers. Do try some of these delicious wines if you get the chance. How nice to hear from you. I too had heard that the region was nothing special, apart from scenery, but I suppose it is what you are looking for. There was nothing wrong with the wines at all and even the one at lunch was attractive and well made, while the others had something extra. They were not Montrachet though that is true, but then who would want Montrachet with fresh anchovies or as an aperitif? The wines were certainly as serious as Gavi or Verdicchio or Grüner Veltliners. Pay a visit and you will see, it is a lovely place and yes the wines are at least nice! I suspect any other view is very out of date. Very nice article. We stayed at the apartment Orlando and Francesco’s parents own in Plan de Barca, a few km inland. Such wonderful people. Their mother, Nanda, made us a jam tart and brought over bowls of peaches and plums from their trees. They have a small fermenting room below the apartment and a tasting room in their own home, which is next to the apartment. They shared a white with us and before leaving we bought some red to take home. Wish we had bought more! That sounds wonderful, please email me the details of the apartment would you? Thank you.